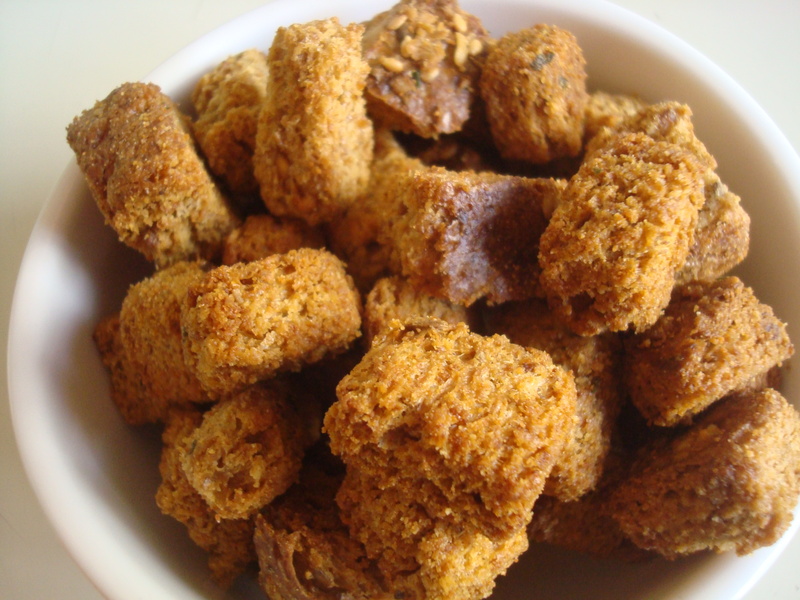 There was this one time when I made croutons…OK, I’ve made them like 5 times. They are so good. 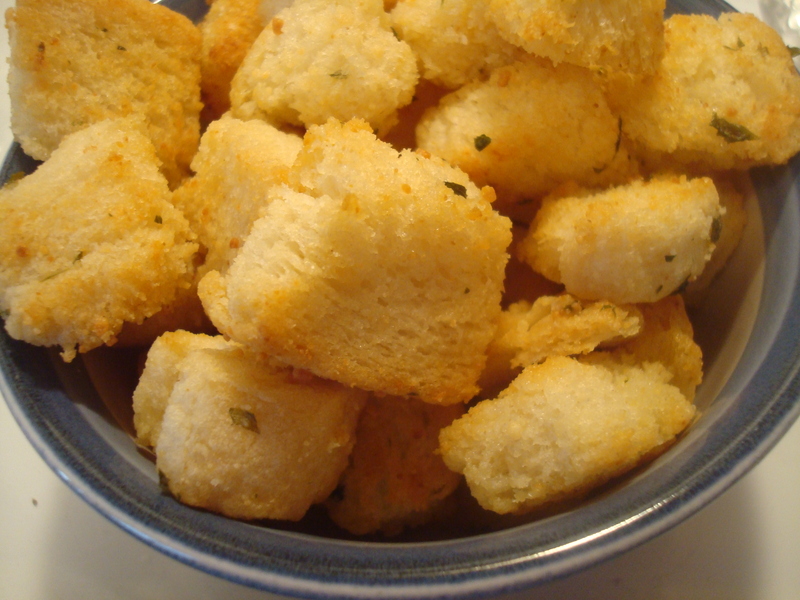 About a year ago, my friend Trish gave me the crouton recipe that she uses, and I made them…AND THEY WERE AMAZING. I made them with both white bread and wheat bread. My friend Trish makes them with gluten-free bread. Any way you go, they will be amazing. Super easy AND super delicious. And when you make them, your house smells fabulous. This recipe makes about 3 or 4 cups of croutons. It depends on what size and type of bread you use, and how small you make them. Trim the crust off of the bread. Slice the bread, and then cube it. You can decide on the size. However you choose, that will be the size of your croutons. Mix melted butter, garlic salt, parsley, and Parmesan until no longer lumpy. 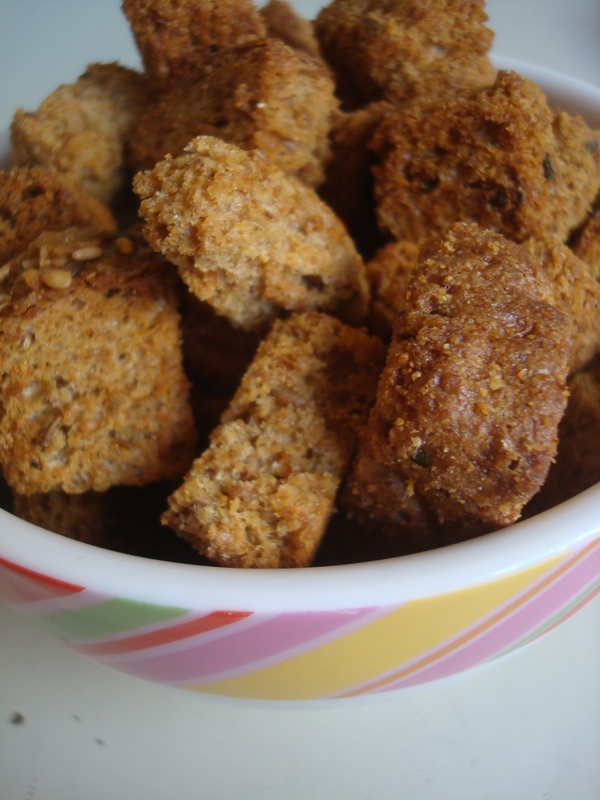 Toss butter mixture with cubed bread in a medium bowl until the cubes are evenly coated. Cover a baking sheet with foil. You don’t need to do this, but it really makes for an easier cleanup. Spray the baking sheet (or foil, if you covered it) with non-stick spray. Spread the coated bread crumbs in a single layer on the baking sheet. Bake for 15 minutes and check to see if they are dry, crispy, and golden brown. If they need more time, check it every 3 or 4 minutes. Sometimes mine are done in 15, sometimes it’s 25. It depends on the kind of bread I use. Take the croutons out and turn them over. I just use my fingers for this. They’re not super hot, and it doesn’t take as much time as you think it would. Bake for 15 more minutes, until they are done. Again, if it needs more time, give it more time. Let them cool. Eat some while you wait. Store the croutons in an air-tight container, or a Ziplock bag (my preference). They are great on salad, in soups, or just eaten as a snack! I took them to class plenty of times and my friends enjoyed eating croutons with me.